The 2011 ABA TECHSHOW was a great experience. I'll be writing more about that later. But one of the really remarkable things about the ABA TECHSHOW this year was the number of iPads in evidence. In some sessions there were more iPads than laptops being used for note-taking. But of course, the iPad is perfect for a conference or convention when you might be changing rooms every hour and the light weight really makes a difference. It seems pretty clear at this point to most anyone paying attention that the iPad is a real game-changer in the same way that the iPhone was. Certainly other manufacturers are now attempting to catch up and produce similar devices. But for now, the iPad rules. Tom Mighell just released his new book, the iPad in One Hour for Lawyers, published by the ABA Law Practice Management Section. It is a short read and at a great price $34.95 (even less for section members.) 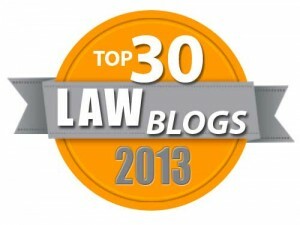 He also launched a new blog, iPad 4 Lawyers. Sharon Nelson and I are both iPad owners. 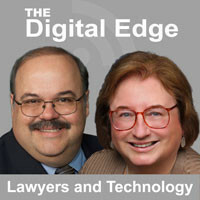 So we decided to have Tom as our guest for this month's Digital Edge Podcast and our topic is... you guessed it ... iPads for Lawyers. You can listen here and hopefully the podcast is also available on iTunes again after some technical problems. Our show notes include some of Tom's favorite apps. Speaking of apps, a great session that I had to miss at ABA TECHSHOW due to speaking at the same time was 60 Apps in 60 Minutes. Reid Trautz, Josh Barrett and Jeff Richardson highlighted many great apps for attorneys using an iPhone or an iPad. They had an overflowing crowd, as you can see. And readers, you can see the entire list of apps right here via iPhoneJD. I've now been to a couple of presentations about using the iPad in the courtroom and have done a presentation myself with another slated for later this week. In my opinion, the reason why iPad's are rapidly catching on with trial lawyers is that a laptop, netbook or even the “traditional” convertible tablet PCs are useful at counsel table, but cannot be carried in the courtroom easily when the lawyer is standing at the podium or addressing the jury. Essentially, the iPad is just a little heavier than a paper legal pad in a holder and not nearly as heavy as the lightest netbook or laptop. The iPad is elegant and fun to use. It is not a desktop replacement, nor is it intended to be. As one critic noted, if your practice is being tied to your desktop generating documents all day, it is not the tool for that purpose. But most lawyers I know are "on the go" quite a bit and to have your e-mail, the web, dozens of useful apps and much more all at the ready in an instant is a great tool for efficiency, whether you are waiting for your case to be called or waiting in a doctor's office. And if at the end of a long day, you blow off some steam with Angry Birds, that is fine too. I'll make one prediction. In the next few years, you will be seeing a lot more iPads and other tablets in public places than laptops. I'll still take my laptop on road trips and it will sit in the hotel room if I need to work on a document or tweak a PowerPoint. But when I head out of the room to meetings or classes, my iPad will be in my hand. • iPadmania (http://almipad.wordpress.com ) is also a worthwhile site to visit, not legal specific.